This project of the ensemble arcimboldo was dedicated to an instrument many people heard about, but they did not really hear it: the trumpet marine. On this site you can find an article about the history of the trumpet marine by Dr. Silke Berdux (conservator of music instruments, German museum, Munich), all informations about the concert-program: "Music of Swiss monasteries with trumpet marines" and an article about the whole project and the performance practice by Thilo Hirsch. A CD recording of this outstanding project is available on the Label musiques suisses. "A trumpet strung with a single string"
Tromba marina, trumscheit, trumpet violin, Mary's trumpet or nun's violin are different names of the instrument that is placed centre-stage on this project of the ensemble arcimboldo. Above all, it is the last of these names that has guaranteed the instrument a certain fame down to the present day, even if ­ as usual ­ this represents but a part of the historical truth. Even more than its appearance, it is the instrument's sound that makes it so peculiar. Although it is a string instrument, it sounds like a trumpet. The reason for this is its asymmetrical, shoe-shaped bridge. It is attached to the body of the instrument only at the short end, while the other hangs freely above it. When the string is made to vibrate, the longer end hits the body and thus creates the trumpet-like brassy sound. However, it is not just the sound quality of the instrument, but its range of notes that corresponds to the trumpet. For it is played only in harmonics, i.e. the string is not pressed down upon the fingerboard, but only touched at the points where harmonics occur. This activates the notes of the natural scale, which correspond to those of the trumpet. The tromba marina was in use from the first half of the 17th century until into the 19th. In central Europe, it was widely used and not at all as rare as we assume today. This is proven by the fact that more than 200 instruments have survived, and numerous sources that testify to its use. In France, which boasts the only tromba marina virtuoso known to us by name ­ one Jean- Baptiste Prin (1669­1743), the instrument was played at court. In Italy, it was used especially in operas with a maritime theme. It is to be found in the secular repertory in German-speaking countries too. Thus the "Music Society" in Zurich printed trombae marinae several times on the title pages of its New Year's pieces in around 1700; and in 1792, Johann Rudolph Wettstein drew a picture of a Basle music society including a tromba marina. The instrument is also occasionally found in the inventories of court music ensembles, as for example in Cöthen in 1733. 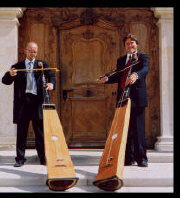 In Switzerland, southern Germany, the Tyrol and Slovakia, the instrument was played mostly in monasteries and churches. There does not seem to be a connection with any particular monastic order, nor was it used exclusively by nuns as the name "nun's violin" might suggest. The tromba marina is known to have been used in both convents and monasteries. In Switzerland, its use is proven through entries in financial records in the monasteries of St Anna in Bruch, St Katharina in Eschenbach and St Urban (Canton Lucerne), St Klara in Stans (Canton Nidwalden), St Carl in Altdorf (Canton Uri), Einsiedeln (Schwyz), Wettingen (Aargau), Maria Zuflucht in Weesen (Canton St Gall), Wonnenstein (Canton Appenzell) and elsewhere. One instrument has survived in both St Andreas in Sarnen (Canton Obwalden) and St Lazarus in Seedorf (Canton Uri), while eight exist in St Katharinenthal in Diessenhofen (Canton Thurgau). In the monastery of Engelberg (Canton Obwalden), several compositions for the instrument by Wolfgang Iten have survived. The tromba marina was used for the instrumental accompaniment of vocal music, and for pieces for instruments alone. In the chronicle of the Dominican Convent of St Katharina in Augsburg, it is written, for example, that in 1697, "6 trombae marinae and timpani [played] together with the organ in the Prince's procession", and that a "Sonata with 4 trombae marinae and timpani" was performed. We also know that in the Seligenthal Monastery in Landshut, the instrument was used to play in processional music. A number of pieces have survived that explicitly mention the use of the tromba marina. Alternative instruments are also often mentioned. Thus, for example, on the Pastorella by Wolfgang Iten, the words "Violini, vel etiam Tubae Marinae"are written. It therefore seems clear that the tromba marina often played trumpet or violin parts when these could be realized on it. Only in very few cases will this have been marked on the parts themselves, so the exact number will remain unknown. Towards the end of the 18th century, the tromba marina gradually disappeared from music life, though it was occasionally played as late as the middle of the 19th century. E. T. A. Hoffmann paid homage to it in his Life and Opinions of the Tomcat Murr, making it the instrument of Tante Füsschen. The instrument enjoyed a renaissance at the end of the 19th century. In the private instrument collections that began to be gathered together at the time, the tromba marina was one of those instruments that had to be included (though its history was confused with that of its predecessor, the trumscheit). It was at this time that the name "nun's violin" was coined ­ posthumously, so to speak, and presumably out of the desire to create a "history" for the instrument. How does one actually come to play the trumpet marine? In the last three years, I have often been asked this, and would therefore like to sketch out the story of my own journey to this admittedly somewhat odd instrument. In museums, my attention was often drawn by this strange, elongated, more than two metre-long string instrument, of which no one quite knew how it sounded. In 2001, the new premises in Lohnhof of Basle's Music Instrument Museum were opened. No less than seven original trumpet marines were there, and one could for the first time hear an example of how they used to sound. I was fascinated. After I had worked my way into the material ­ there is a wealth of literature on it ­ it became clear to me that the trumpet marine must have been a perfectly "normal" instrument in the 17th and 18th centuries. Its being spread widely across the whole Alpine region, the fact that the royal court ensemble of France had its own section called crumhorns and marine trumpets from 1661 to 1762 (thus for more than 100 years) ­ all this seemed to confirm my assumption. When the original instrument of the trumpet marine virtuoso Jean-Baptiste Prin (1669­1743) finally surfaced in a private Swiss collection two years ago, after having been thought lost since 1900, my ideas took on concrete form. I wanted to reconstruct this instrument, and to learn to play it. Thus began one of the "last adventures" of early music. After I had found an interested violin maker in the person of Jürg Buchwalder of Basle, who also had a delight in experimentation, we had numerous constructional problems to solve. In November 2002, the first of the two instruments was finished, and I could begin fitting it out and practising it. The principal matter was making a good buzzing bridge (the problems of making and installing one are documented often in the historical sources). After carving and trying out numerous bridges, I succeeded in producing all the notes evenly (from the 3rd to the 16th overtone) and with a trumpet-like sound. While learning to play the trumpet marine from the historical sources ­ above all J. B. Prin's "Reminiscences of the trumpet marine" from 1742 ­ I was also searching for pieces from Swiss monasteries of which it was proven that they featured the trumpet marine, or which had been composed for it (see the article by S. Berdux above). The fruits of this fascinating musical treasure hunt in Baroque monastery libraries can be divided into three groups: The first comprises larger-scale ensemble works with two trumpet marines, such as the Salve Regina by Franz Niklaus Jakob from St Andreas in Sarnen, the offertory Majestas Domini by Wolfgang Iten from the Engelberg Monastery, and the Gaude Felix by Johann Friedrich Korb that was written for the monastery of St Katherinental. The trumpet marines here have the same function as "normal" trumpets and are usually denoted in the parts as clarino or tromba. 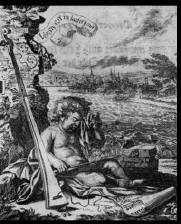 It seems to have been usual to have trumpet marines play these parts; even the trumpet marine-playing cherub on the Zurich New Year's Piece of 1699 is reading from a part marked clarino. The second group comprises works in which the trumpet marine is used as a solo instrument, as for example in Iten's Inter choros angelorum or his Pastorella, which is a duet with another trumpet marine. What is interesting about the latter piece is the change of name to Trompetta Maria. A tromba maria is naturally far better suited to a monastery than is a tromba marina, which brings sailors to mind rather than the Virgin Mary. The third group comprises the "special" pieces that I discovered while on my search. 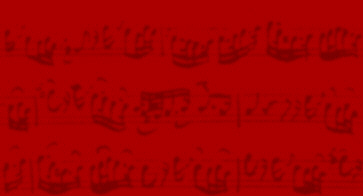 One of these is the Mish-mash or cassation for violino, viola and basso with little trumpet, gugu and Rätschchen by Nescio (from the Latin nescire: "not to know"). Presumably, someone did not want to call the composer "anonymous", and so gave their "not knowing" as his name. 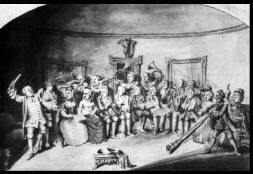 The instruments "little trumpet, gugu and Rätschchen" in the title were probably the same "Berchtesgaden children's instruments" as are used in the "Kindersinfonie" by Johann Nepomuk Angerer (1740­1794), previously ascribed to Joseph Haydn. These "special" pieces also include the anonymous arias with obligato cello from St Lazarus in Seedorf and the organ concerto by Marianus Königsperger from the Katharinental Monastery. In order to expand the radius of the trumpet marine's repertoire into the 21st century, the ensemble arcimboldo commissioned a work from Michael Bürgin (*1969). After a performance in the German Museum in Munich, a criticwrote the following about Bürgin's piece, entitled Journey to Ettingen: "With the Journey to Ettingen we experienced an unexpectedly chromatic turn of the screw. Amongst these historical Swiss sacred gems, Michael Bürgin has smuggled a cantata enriched by jazzy bass riffs, unusual pizzicato effects and Orffian force." f#² (when starting on C), and also the 13th overtone, a very low a². In the 18th century, this phenomenon of the "impure" overtones was an everyday matter, since before the invention of valves, all the brass instruments without a slide had to deal with it (the length of the vibrating column of air could not be altered, except in the case of the trombone and the slide trumpet). One could protest, however, that today's Baroque ensembles also use natural trumpets, and that they have no problem with intonation. However, upon closer inspection, one realizes that these so-called natural trumpets are played with up to four finger holes ­ a practice for which there is no historical proof, neither in the numerous old trumpet tutors, nor in the surviving old instruments. This is in fact an invention of the 20th century! between "open" and "stopped" notes. For the present CD recording, we naturally would have had the possibility to "improve" the natural overtones of the trumpet marine through the use of recording tricks. But it seemed more important to us that the instruments should sound as authentic as possible, even if this meant occasional, minor uneven passages. We are delighted to be able to present on this CD the results of a quite special musical "adventure", and we invite you to discover, together with the ensemble arcimboldo, an unknown, forgotten world of sound.